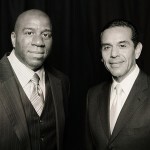 Just photographed portraits of Magic Johnson and Los Angeles Mayor Antonio Villaraigosa during Loyola Marymount University’s Urban Economic Forum in Los Angeles. I was only able to get them for a very short period of time….and at different times. The image above is a composite of two images taken separately. All Images Copyright © David Savinski|ProPhoto WordPress Blog by NetRivet, Inc.